I seem to not be doing a very good job of managing my time once again so I've been very discombobulated when it comes to writing posts on a regular basis. Not that I worry about it very much like I used to back in the "heyday of blogging" when I darn near panicked if I didn't have a new post up every day. As much as I miss the old days of blogging and getting a good number of comments on a post, I sure don't miss that feeling of pressure and am now quite comfortable if I only get a new post up a couple of times a week and if I only get a few comments here and there well, that's okay also as I know that people lead busy lives. Speaking of busy lives, this upcoming weekend is going to be a very busy one for me. I should probably point out that by "weekend" I mean batch of days off as I don't have normal weekends like other people but I do have regularly scheduled days off. After tomorrow's 16-hour shift I'm off for four days but Wednesday is going to be busy with a memorial mass for a friend's father followed by a visit with my mom before I come home to a lot of last minute stuff before I drive both girls up to the Boston area on Thursday where they will be going for Anime Boston. Jamie is going with friends from Franklin, Massachusetts so I'll drop her off first and then continue to take Amanda and a friend or two of hers to Quincy where they will meet up with more friends before heading into Boston on Friday. Truthfully I will be quite glad when this "con" is over as all of the preparations that both girls have been doing have been driving me nuts. Amanda is going to be selling things in Artist Alley so send good thoughts her way that her drawings and charms and other things are a hit! Hopefully I'll get some stuff done around the house on Friday as Saturday I'll be heading to a small town north of here to do the photography at the wedding of a co-worker. My fingers are crossed for good weather as we're hoping to do pictures outside in a park in between the wedding service and the reception. This is only going to be my second full wedding so I sure hope I do a good job, the thought of messing up someone's pictures on their special day makes me a bit nervous! Afterward I'm sure I'll come home and try to do some photo-editing before I call it a day and get some sleep before Easter Sunday's 16-hour shift. After working my way through Sunday, Monday, and Tuesday I've got a couple days to fall back and regroup before I head north on Friday for Salem where I'l l be spending the weekend at a friend's house and doing a lot of running around in the Lexington/Concord area. Monday is Patriot's Day in Massachusetts when they celebrate the first battle of the American Revolution - which was actually April 19th but you know how the government loves to turn things into three-day weekends! - and they do their celebrations up big. I'll be visiting Concord and Lexington both to try to get some pictures of the various activities and re-enactments that will be going on. In between I'm looking forward to visiting with Walt and Juli again as well as meeting up with Rhonda whom I met when we were both judges at the Hawthorne Hotel Halloween Ball as she'll be up from New Jersey that weekend, too. And in between all that I'm working on a post for The Distracted Wanderer about some of the local history here in Norwich for which I went out and took a lot of pictures last week. The picture at the top of this post was part of that photo jaunt and is from the Colonial Cemetery and Old Burying Ground. I shot it really quick as I was walking past to get to a historic home that I wanted to take some photos of but I liked the way it came out so thought I'd share it here. And I'm sure that me posting a picture of an old cemetery comes as no surprise to anyone, right? So, that's my upcoming schedule - how are things looking in your part of the world? Sounds like days off are still like work. Hope you get some down time to rest. I'm tired just reading all this. Wow, you've lots to do. Sounds like you have a busy time ahead Linda. We're off on another jaunt on Friday until Monday, to the Severn Valley and Ironbridge. Of course I'll be taking the camera with me and reporting back next week. 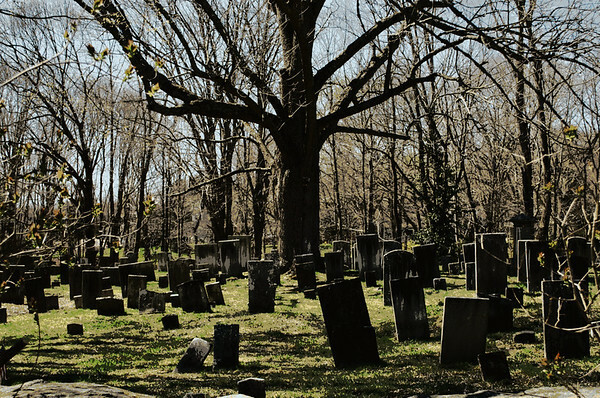 Those headstones look old and lonely. Just sayin. Have fun in all your 'doings.' I know photos will surely follow, just like day follows night. I had a busy weekend planned, but after reading about yours, I am now too tired to do anything! Best wishes for Amanda to do well with her sales. Sounds like a great step for her.